Support the Jackrabbit Baja SAE club in their inaugural year build/compete an all-terrain vehicle. Jackrabbit Baja SAE is looking to raise $5000 to help support costs to build and compete an all-terrain vehicle for the 2019 SAE Baja student design competition. The money will help the club pay for vehicle parts and travel costs associated with the competition. Before diving into what our club Jackrabbit Baja SAE is about, it would be beneficial to clarify and explain exactly what Baja SAE is. Baja SAE is a student design competition that is associated with the Society of Automotive Engineers (SAE). SAE has a wide variety of design competitions that challenge students to take their knowledge beyond textbooks and the classroom and allows them to design, build, and test the performance of a real vehicle. At the SAE competitions, schools are able to compete their vehicle against 99 other schools from all across the globe. Schools such as Cornell, RIT, MIT, Iowa State, Gonzaga, North Dakota State University, etc. 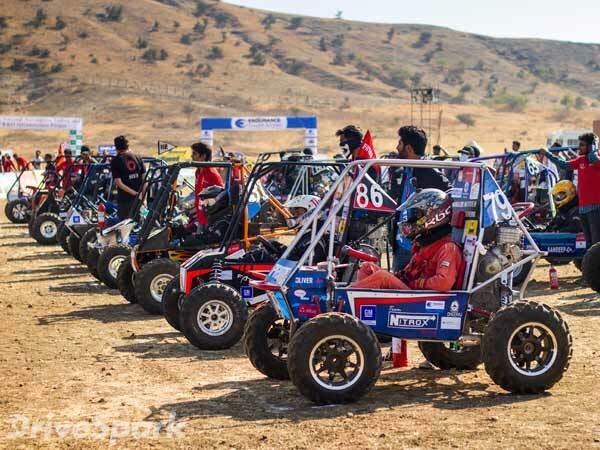 Specifically, in the Baja SAE competition, engineering students are tasked with designing and building a single-seat, all-terrain sporting vehicle, which is to be a prototype for a reliable, maintainable, ergonomic and economic production vehicle, that would serve to a recreational user market. Students will have to function as a team to design, engineer, build, test, promote and compete their vehicle. This year, the Baja SAE competitions are held in California, Rochester NY and Tennessee Tech. Jackrabbit Baja SAE is a team/club here at SDSU in our inaugural year, which will look to compete in the California Baja SAE competition, coming up in May of 2019. To accomplish this, a hard-working group of mechanical engineering students are in the process of designing and fabricating an All-Terrain vehicle to compete in May. Students who are apart of this club will gain lifelong friendships, and will open up opportunities for young engineers to learn how to work as a team in a real-world environment. Jackrabbit Baja will also help further student education by allowing students to gain real world engineering experience and the chance to network with future employers and other engineering students from around the world. Currently, our all-terrain vehicle is in the design phase of the project, but is very close to being complete. The past couple of months, the Jackrabbit Baja SAE club has been hard at work in the design phase trying to create an optimal and realistic vehicle that can withstand the punishment it will take at competition. Within the next month, building of our all-terrain vehicle will begin and hopefully be complete in March or April to be tested. Now this is where we need YOUR help. We estimated that we will need a budget of $15,000 dollars, where $10,000 will go to registration fees and parts, such as an engine, steel material, and other components. The other $5000 will go to travel costs to help the team drive out to California and compete our Baja vehicle. We are looking to raise $5000 from this project to support our goals and aspirations to compete. All money donated will go to the team to help with travel or parts. Any extra funds will be used for additional fees or saved for next year. To keep updated on the progress of our vehicle, please feel free to check out our Facebook page. Updates will be posted about the vehicle and competition. Any support is greatly appreciated! All donations, no matter how big or small, will go a long way to help this club reach our goals. Though, you do not need to give money to help us! You can also share this project with anyone that you think would help support us, the more people we can reach the better. Thank you for any and all support you are able to provide in helping us reach our goal. Keep updated with our progress and we hope you see our Baja vehicle cruising around Brookings before long.